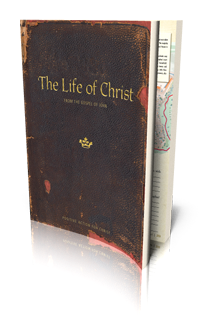 Connor and I have had the opportunity these past few weeks to review a program from Positive Action for Christ called The Life of Christ. This program is meant for junior high or high school, and it is a full-year curriculum -- 35 lessons, each meant to take a week. We found that the first two lessons were significantly longer than the later ones, so I would consider this to truly be a 37 week program, as I would spend two weeks on each of the first two lessons. We received a Student Manual (pictured here, $17.95) which is a pretty hefty book. 8x10" paperback, gorgeous glossy antique-looking pages, great quality. It is so very inviting! We also received the Teacher's Manual ($41.95). This comes in a three-ring binder, and includes notes for the teacher and reduced-sized student pages (with answers filled in with a bold font). The beginning also includes a fair amount of information on ways you can use this study. We chose for Connor to work through the student pages over a day or two on his own, then work through the teacher materials, with whatever is left of the week for quizzes or further research. So a typical lesson (after the first two) would involve Connor reading a couple of pages of text and looking at great diagrams or other illustrations. Then there is usually a page or two "Student Work" which is fill-in-the-blank, coming straight out of the Bible. Then it is time for the teacher part of the lesson. The workbook has a page or two of note-taking prompts, so Connor pays attention and fills in the blanks as I read through the teacher material. We are really, really enjoying the discussions we are having during this time. The final part of the student book is called "Digging Deeper" and it includes generally about four suggestions for additional activities. Some are fairly hands-on (build a 3-D model of Herod's temple). Some involve research (conduct a detailed study of the life of Nicodemus). My plan was to have Connor choose one Digging Deeper activity for each lesson, but we ended up not really having the time as we were trying to complete a couple more lessons for purposes of this review. The Teacher's Manual also has quizzes and unit tests. These are a combination of true-false, matching, short answer, and essay questions. Bottom line: We love this study. We will repeat it with other kids, probably grouping William and Thomas, and then grouping Richard and Trina. I will be looking into other middle and high school titles as well, such as Wise Up! about Proverbs (middle school) or Proverbs: The Fountain of Life (high school). There is also a study based on Pilgrim's Progress that looks interesting. 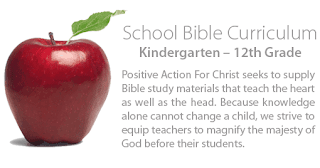 Other members of the Crew reviewed some of Positive Action for Christ's elementary programs a couple weeks ago, and you can read about them here. 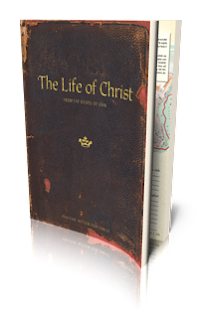 Disclaimer: As part of the TOS Homeschool Review Crew, I did receive the Life of Christ study. The fact that I received complimentary products does not guarantee a favorable review. It does guarantee a review. A fair review. But I am not going to praise something unless I think it deserves the praise. If I don't like it, you'll hear that. And hopefully with enough detail as to why so you can decide for yourself if what I hate about it makes it perfect for your family. For more about my take on reviews, visit my blog post here. I am considering this item so enjoyed reading your review - thank you! I'm looking for a new Bible study- will you give Connor any credits for completing this? Thanks for the good info here! Chris -- YES! I am having him track time for Lessons 3-6, and I'm going to figure out how much credit I think this is worth based on that. Now that the review is done, I am going to be requiring some of the Digging Deeper projects (we just didn't have time!) I think this definitely qualifies as high school credit-worthy.